The color black is all the colors mixed together. For some it ignites a number of associations, it’s been implicated: It may provide opportunity for menace in the absence of light; it can inspire dread when viewed as monochromatic art by Louise Nevelson or Robert Rauschenberg, to name but a pair; or it may appear as elegance when worn from head to toe. If you have been paying attention as you meander the streets of Buffalo and environs, you may have noted the preponderance of purveyors pushing “black” at you. There is The Black Sheep on Connecticut Street. There is Black Iron Bystro out in Blasdell. There is Black Swan Lounge on Elmwood Avenue. There is a new distillery, also on Elmwood, named Black Squirrel. And there is a relative old-timer, Black Dog’s Tavern. Rumor had it, during a recent elbow-to-elbow moment at Black Sheep’s bar, that Vera Pizzeria owner Cameron Rector attributes the emergence of The Blacks to “a gush of love for Buffalo and bourbon—it’s the Bs.” Or something to that effect. The Public couldn’t reach Rector for an expansion of his thesis before deadline. Following is a survey of The Blacks. The Black Sheep, open every day but Sunday, is co-owned by chef Steven Gedra and pastry chef Ellen Gedra. Their previous place, Bistro Europa, was less than half the size of this still-rather-new business. The Black Sheep logo is its typography—all caps and paint-brushy. In the barroom there is a large black-and-white photograph of sheep, all white. Nicholas O’Brien, bartender, offered the house explanation for the name. “It’s called Black Sheep because Steve and Ellen are the black sheep of their families. I am the black sheep of mine—they all have families and homes and straight jobs and I haven’t worked a normal person’s job in 12 years.” He is wearing a black uniform; he puts down a black cocktail napkin; there are black stir sticks. That’s as black as it gets in here. “Ultra-modern, sophisticated” Black Swan Lounge, opened in March 2015, features a curving logo of a black swan with red atomic eye and bill over the entrance. Owned by Monique Fortunato-Lester and Bryan Lester, it’s in the former Cozumel space and has one of Buffalo’s largest patios. Black Iron Bystro is owned by Bryan Mecozzi and managed in part by sister Lyndsey Mecozzi (all things bar) and chef Dustin Murphy. The well-composed interior features flourishes of black, like shiny/slippery black booths. Bryan created several light fixtures from metal plumbing parts. “No welding involved,” he says. “I think of Home Depot as my Michaels.” This building belonged to the Mecozzi’s grandfather, who worked at Industrial Power & Lighting: There’s a meticulousness about the room, a mix of growing plants, handmade items, and estate pieces. There’s no black on the menu, but there is a White Lie: gin, aperol, grapefruit juice, and orange bitters. In addition to crafting ultra-smooth bourbon made from maple syrup, Black Squirrel Distillery has crafted a tall, squirrelly tale about its name’s origin. The “legend” involves cross-Niagara River rum-running, a dead man, and a one-eyed black squirrel. Co-owners Brian Fending and Jason Schwinger report that to date their product is in 10 restaurants and soon they will have retail space on Premier Group shelves. Paradise Wine and Gates Circle Wine & Liquor already carry Black Squirrel. The duo says that their logo, a silhouetted black squirrel, is not, in sooth, holding a golden nut in his paw, but that “he’s stealing the ‘I’ of the word squirrel—or maybe it’s his missing eye.” Fending and Schwinger are collecting anecdotes about black squirrels like squirrels collecting chestnuts. 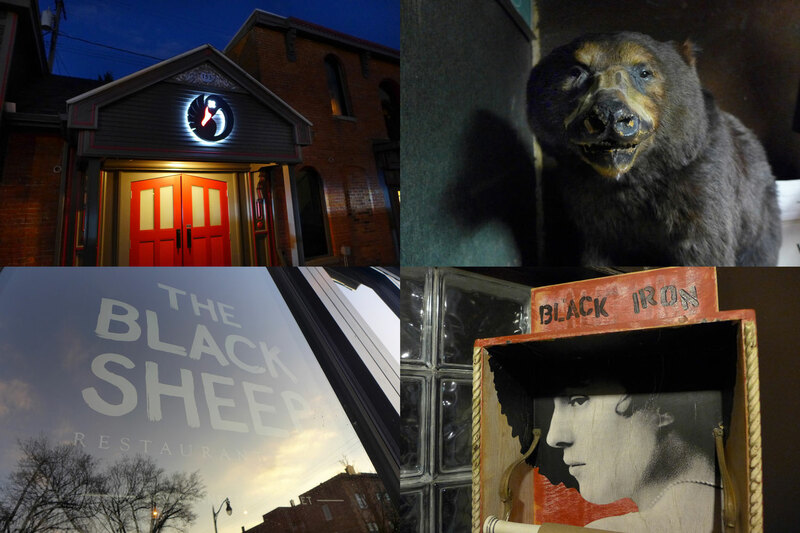 Black Dog’s Tavern in South Buffalo is owned by Paul, a former priest who has recently been collecting taxidermied animals: A small black bear stands near the pool table. On a recent visit there was no black dog on the premises, but a white dog, Buddy. The bar, one of the longest around, has been open for approximately four years. In the grand local scheme of The Blacks, it is the most mysterious indeed.